Slotted Weights are used in a variety of applications such as pressure, torque, and tensile strength testing. Cast Iron Slotted Weights are typically used with a hanger that also has its weight calibrated so the hanger can be used as part of the overall weight under test. Several Cast Iron Slotted Weights may be used together to build up from a minimum weight to a maximum test load. The hanger weight selected should be able to accommodate the total load needed. Cast Iron Slotted Weights are manufactured from a high-quality iron. Castings surface are smooth and are free of cracks, pits, and sharp edges. Our range of Cast Iron Slotted Weights starts from 500 g to 20 kg, 5 N to 200 N and 1 lb to 50 lb. Below 500 g / 1 lb are made of Brass or Stainless Steel. There is an adjusting cavity in each weight of Cast Iron Slotted Weight from and above 500g / 1 lb. Weights below 500g / 1 lb may be adjusted by removing material from the underside of the weight. Each weight has the nominal value casted or punched into the topside of the weight. Weights made of Cast Iron are protected by a durable coat of paint – black or gold for metric and silver for avoirdupois – to protect the casting from rusting. Weights made of Brass or Stainless Steel are highly polished. Cast Iron Slotted Weights are typically used with a hanger that also has its weight calibrated so the hanger can be used as part of the overall weight under test. 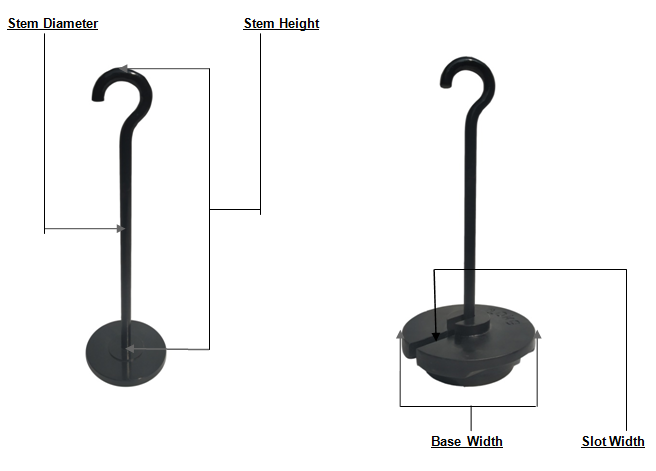 Weight hangers are available in a variety of lengths and weight capacities. We are the manufacturer of exclusively Weights since 1961. We are exporting our products since 1972. We are regularly exporting our weights to more than 40 countries. Our weights have been appreciated by several overseas institutions. Our calibration laboratory has been accredited as per ISO/IEC 17025.